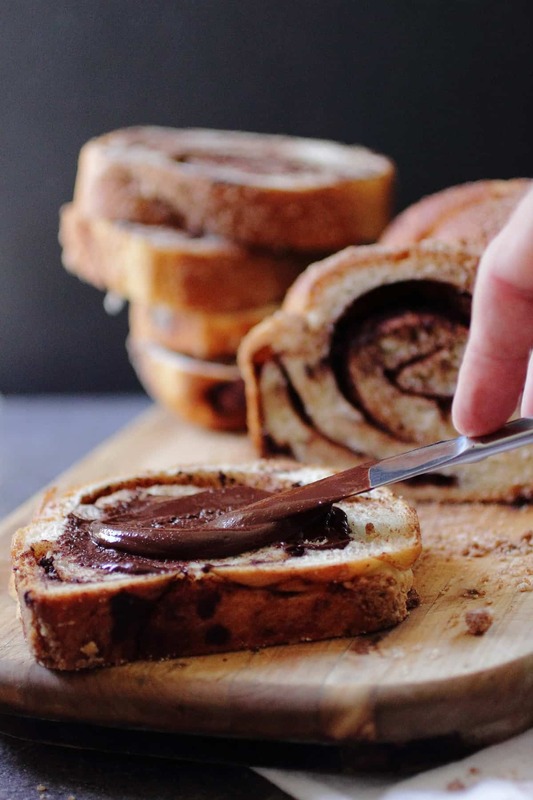 If someone wanted to give you a slice of bread that was filled with rich dark chocolate swirls and spiced with cinnamon, you’d take it. Trust me, that’s what this traditional chocolate cinnamon babka bread is all about. I’ve tried chocolate babka from New York and it was good…really good even after being stuck in an overhead bin for five hours. So I had something to go on before I made my own. I knew it had to be swirly and full of chocolate and truthfully, it’s not the most beautiful loaf out there but each one is so unique. 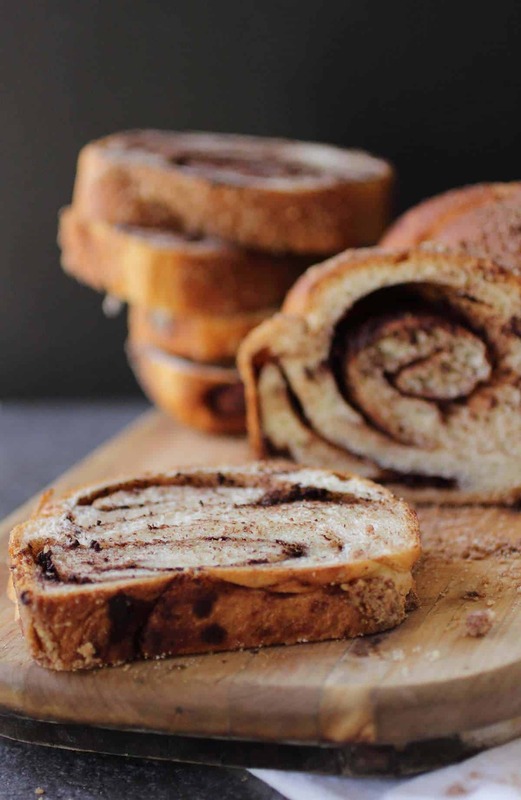 There’s been a lot of debate between chocolate babka and the other one, the cinnamon babka. I couldn’t choose and ended up mixing the two flavors together. 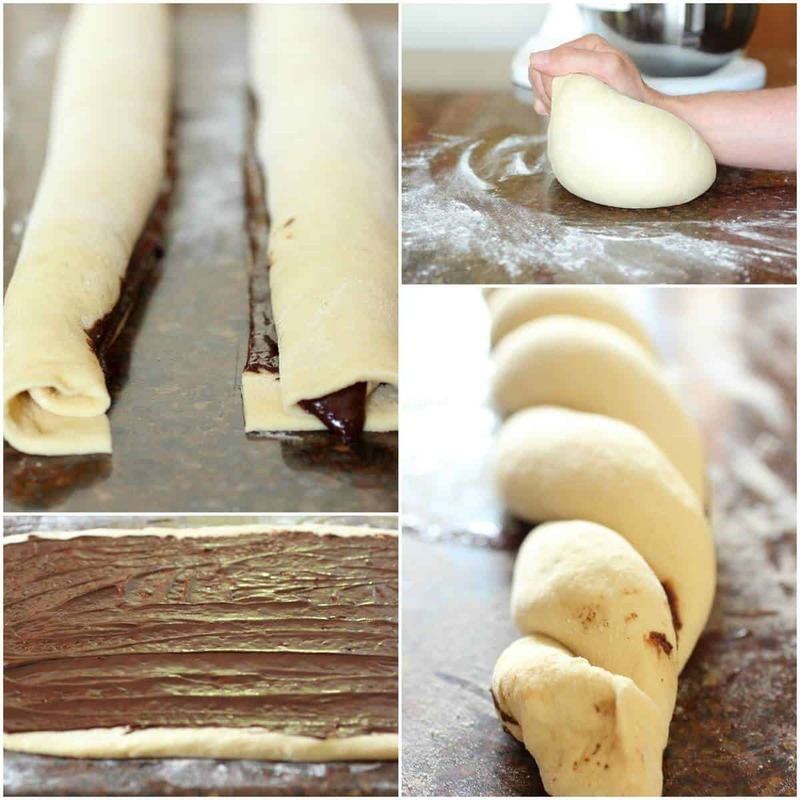 Making babka, like making any yeast product can be a labor of love but it’s worth it. You can start this bread when you get up in the morning and have it sitting in front of you by lunchtime thanks to Quick Rise Yeast from Red Star. It can be a little messy but the worst thing that’s going to happen is you’ll be covered in chocolate which is awful…said no one ever. I’m always amazed at how fast the quick rise yeast works. I’ve used it for all of my yeast products and never been disappointed. I think a lot of people shy away from working with yeast because of the time involved and watching the dough rise. It’s not like making a cake where you mix it, throw it in the oven an 25 minutes later it’s right in front of you. Making bread is such a cool experience though and even my daughter knows when I have dough rising, and she’ll give the bowl a big sniff. If you hit a problem, make sure to check out the troubleshooting guide Red Star provide, but most of all just enjoy what you end up creating. Very few times will something happen that your creation will be completely inedible. 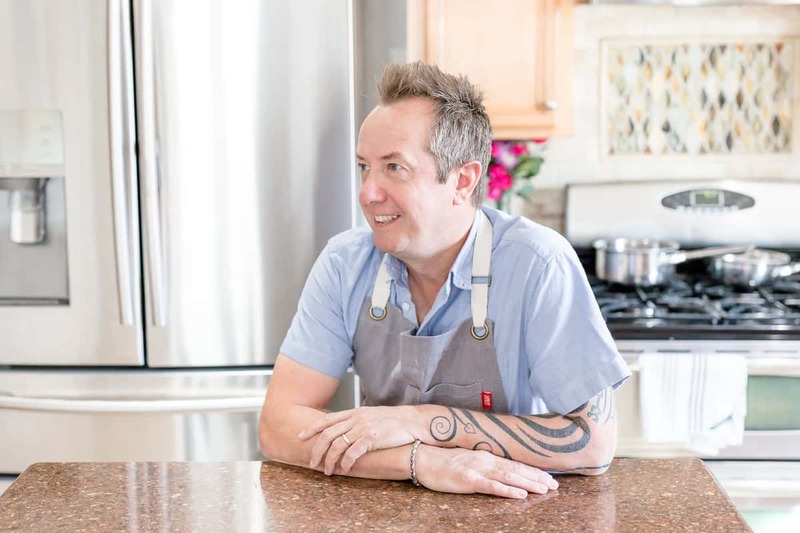 Make sure to follow Red Star Yeast on Pinterest for inspiration and easy recipes! This is a sponsored post on behalf of Red Star Yeast. Compensation was provided although thoughts and opinions are always my own! Combine the butter, chocolate, cocoa and sugar in a pan and whisk over a medium heat until everything has melted and come together. Set aside. Grease two 9 x 5 baking loaf tins with butter and set aside. In a bowl combine the warm water and Red Star Yeast. Whisk briefly to dissolve the yeast. Add the sugar, dried milk and egg and whisk to combine. Add 2 cups all purpose flour and mix together using a wooden spoon until a dough is formed and there are no lumps visible. Let the mixture rest covered with a towel for 30 minutes. After 30 minutes, add the olive oil and salt Beat with the wooden spoon. Add the remaining 1 1/2 cups flour mixing well. Transfer the dough to a stand mixer fitted with a dough hook. Mix on low speed for about 2-3 minutes. Form the dough into a ball and place back in the bowl it was in, cover and let rise for another 30 minutes. After 30 minutes dump the dough out onto a well dusted worktop and using a rolling pin, roll it into a rectangle shape about 12 x 15 inches. Spread the chocolate filling over the dough covering it well. Evenly distribute the 1 1/2 tablespoons cinnamon on top of the chocolate. Cut the dough in half horizontally in front of you. Take the edge of each piece and roll it towards you like you would do with cinnamon buns. You'll have two long tube shapes side by side. Take each piece and braid them tightly against one another tucking in the ends. Cut the braided loaf in half and place each half in the prepared loaf pans. In a small bowl combine the ingredients for the topping and make a crumble with your hands. Glaze the loaves with the beaten egg and generously top with the crumble topping. Cover lightly with some plastic wrap and let rise for 20 -30 minutes until the bread has risen to about the level of the baking pan. I like to let the bread sit on top of the stove to capture some of the heat from the oven. Bake for about 30 minutes and the bread turns a deep golden brown. Let cool before slicing. If you don't have two loaf pans , these can easily be baked on a cookie sheet pan. Use a serrated knife for easier slicing. GORGEOUS! 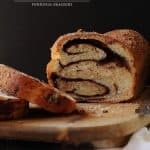 I am an avid bread baker, but have yet to try my hand at babka. That needs to change ASAP! The bread is decadent enough, but to put nutella on it—–geez you are killing me. I love cinnamon bread. I don’t think I have ever had bread with chocolate swirls. 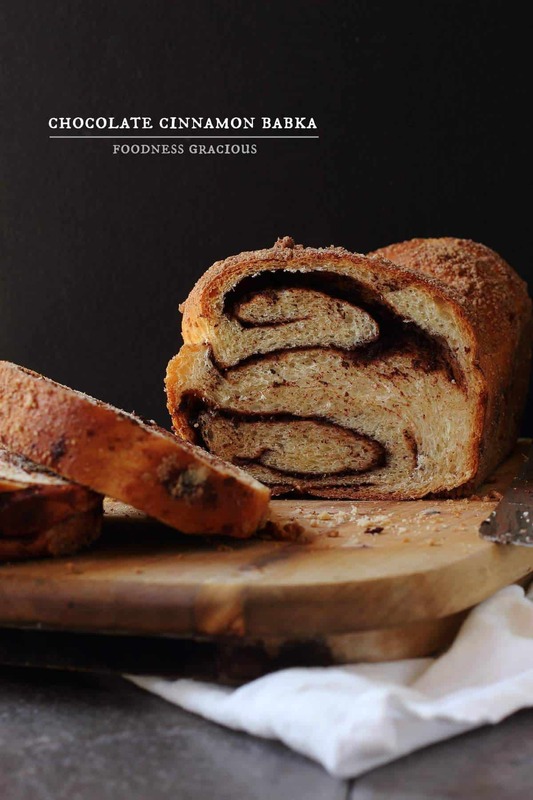 Gorgeous bread, who could resist those chocolate swirls?! Killer!! Your swirl is perfect! I want to reach into the screen and grab the whole loaf! It looks divine! I just drooled a little. Love! Gorgeous! I love the twisty-wisty interiors of a babka.